Six weeks ago I wrote that 2016 could mark a turning point in efforts to force fossil fuel companies to reckon with their record of twisting the facts on climate change. I’ve seen two key developments in the last month that signal momentum is truly building to bring attention—and accountability—to the fossil fuel industry for having misled consumers and the broader public about the risks of global warming. Last month, the Center for International Environmental Law (CIEL) released a trove of documents revealing that the oil industry has been well aware of the potential climate risks of fossil fuels for decades. The uncovered industry documents show that the petroleum industry was conducting climate research as early as 1957, corroborating evidence that major oil companies had a sophisticated command of climate science by the 1980s. Meanwhile, in California, the Climate Science Truth and Accountability Act (SB 1161), authored by Senator Ben Allen (Santa Monica), has passed through two senate committees and will soon face a vote before the entire California State Senate. This narrowly targeted bill, which focuses on corporate deception relating to climate change science, has garnered support from more than 30 organizations that recognize the threat of climate change and the importance of defending the public from industry foul play. The documents unearthed by CIEL are not the only recent discoveries that track the fossil fuel industry’s deep knowledge of climate change back decades. Recent reporting by Inside Climate News and the Los Angeles Times has also revealed that for decades many fossil fuel companies were not only aware of climate change, but were at the leading edge of understanding it. Some were even making investments to fortify their own infrastructure from climate change. Meanwhile, other evidence highlights how many fossil fuel companies and their trade groups downplayed the risks of their product to the climate, often by casting doubt on the science of climate change. The sum of these revelations now makes it clear that the industry’s professed doubt about climate change has not been an honest attempt to discern the facts, but PR spin intended to confuse consumers and fend off competition from lower-carbon energy sources. Aside from the moral implications of the fossil fuel industry’s deceit, there is a question of whether their behavior was unlawful. It is possible that fossil fuel companies violated California’s Unfair Competition Law, which protects consumers from deceptive, misleading, and fraudulent business practices. This law typically requires legal action within four years. However, a statute of limitations can sometimes be suspended (“tolled,” in legalese) if the unlawful behavior is hidden from the public. Consequently, there is uncertainty about when the statute of limitations runs out in a case like this. Here is where SB 1161 steps in: the bill says that any cases addressing violations of the Unfair Competition Law that relate to deceiving the public about climate science won’t get caught up in procedural debates about whether the statute of limitations has run—so long as the cases are brought in the next four years. The result is that the state attorney general or a district attorney could fairly litigate any acts of unfair business competition relating to climate science so long as the investigations lead them to file a lawsuit before 2021. To be clear, SB 1161 does not presume that any fossil fuel company has violated the law. But should the evidence support legal action, SB 1161 will give public prosecutors a more powerful tool to pursue it. It would be an unfortunate contortion of our justice system for a fossil fuel company to escape prosecution for unlawful acts simply because it successfully hid the evidence from public view. SB 1161 protects the public from such a risk. Carbon emissions are now impacting California, contributing to drought, rising sea level, more frequent and intense heat waves, and longer and more damaging wildfire seasons. 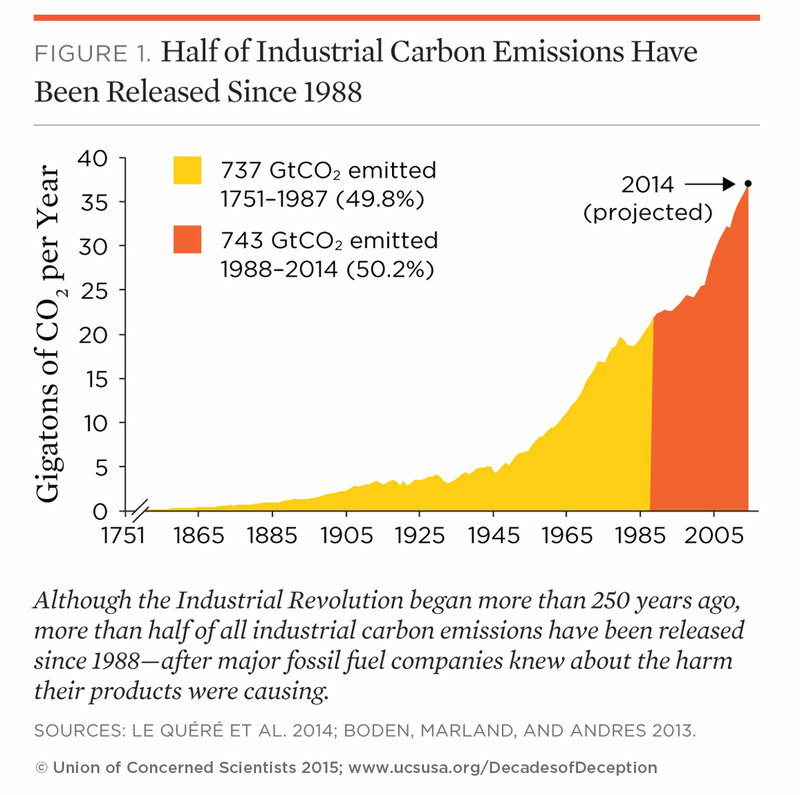 Since 1988, when fossil fuel companies knew the risks and likely consequences of their products to the climate, industrial carbon emissions have doubled. These emissions will significantly increase the costs and risks to our communities, health, and economy. As California continues to take important steps to reduce heat-trapping emissions and prepare itself for the unavoidable impacts of climate change, we must also take an honest look at how we have come to find ourselves in our current predicament. While responsibility for climate change is certainly spread across society, fossil fuel companies have a unique responsibility, which includes accountability for misleading consumers on climate science in order to block low-carbon alternatives. California’s state senate has a chance to send a powerful signal that misleading people about climate science is unacceptable. I work at Union of Concerned Scientists and I live in California. I wrote this post for the UCS blog (original post here) but I thought that the Daily Kos community would be interested in it, too -- If you live in California, please consider calling your state senator in support of SB 1161.